Huwerl Thornton knows something about fatherhood. And teaching and learning through books. The 50-year-old has spent many years in classrooms, both as a student and then as an elementary school teacher for 14 years in New Haven. 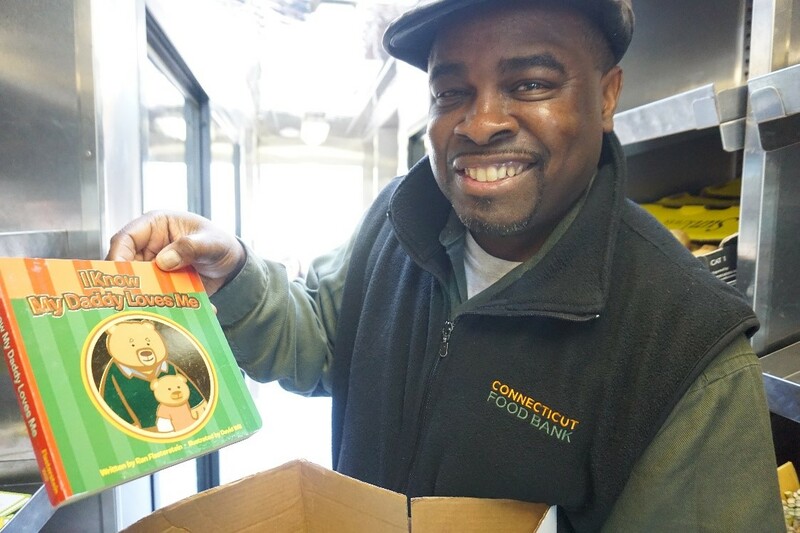 A champion of Read to Grow and its work for early childhood literacy, he’s now Youth Programs Coordinator for Connecticut Food Bank, which serves six of the state’s eight counties. He oversees its two special projects for young kids — the BackPack program and the GROW! Truck. Read to Grow has been partnered with the GROW! Truck for four years. The truck—a large mobile food pantry—serves families with children in Head Start, giving them food, children’s books from Read to Grow, and workshops on topics ranging from childhood literacy to family-life management. Read to Grow staff gives the literacy workshops. At Read to Grow, we distribute about 190,000 books annually and regularly give bilingual literacy workshops through partnerships that include our collaboration with the GROW! Truck. Now in our 19th year, we hope you’ll support us in promoting language skills and literacy for children, beginning at birth. WE APPRECIATE DONATIONS OF ANY AMOUNT. THANK YOU!